Protein Blend (Milk Protein Isolate, Whey Protein Isolate), Butter (Cream), Soluble Corn Fiber, Erythritol, Unsweetened Chocolate, Palm Oil, Calcium Caseinate, Natural Flavors, Water, Cocoa Butter., Contains Less Than 2% Of The Following: Sunflower Lecithin, Sea Salt, Baking Soda, Sodium Caseinate, Xanthan Gum, Steviol Glycosides (Stevia), Peanuts. Protein Blend (Milk Protein Isolate, Whey Protein Isolate), Soluble Corn Fiber, Butter (Cream), Palm Oil, Raisins, Erythritol, Oats, Natural Flavors, Calcium Caseinate, Water., Contains Less Than 2% Of The Following: Cinnamon, Sunflower Lecithin, Sea Salt, Baking Soda, Xanthan Gum, Steviol Glycosides (Stevia), Peanuts. Protein Blend (Milk Protein Isolate, Whey Protein Isolate), Peanut Butter, Soluble Corn Fiber, Palm Oil, Butter (Cream), Erythritol, Water, Calcium Caseinate, Peanuts, Natural Flavors., Contains Less Than 2% Of The Following: Sunflower Lecithin, Sea Salt, Baking Soda, Xanthan Gum, Steviol Glycosides (Stevia). 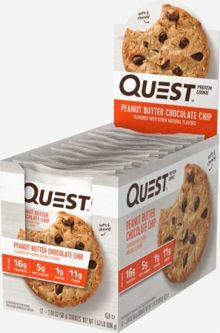 Finally, Quest puts out something we all really love! Protein Blend (Milk Protein Isolate, Whey Protein Isolate), Peanut Butter, Soluble Corn Fiber, Palm Oil, Butter (Cream), Erythritol, Water, Calcium Caseinate, Peanuts, Natural Flavors. Contains Less Than 2% of the Following: Sunflower Lecithin, Sea Salt, Baking Soda, Xanthan Gum, Steviol Glycosides (Stevia).